Click to see a larger version! One loads a marshmallow in the breech (Safety Tip: Breath in deeply BEFORE putting your mouth on the mouthpiece, or you'll suddenly find yourself inhaling the ammunition), and, well, it's a blowgun, you can figure it out. It turns out that Marshmallows are not a particularly accurate projectile, which probably explains why the military doesn't have a marshmallow round for their standard field weapons. But they're pretty good for shooting across a room, as drarwenchicken helped test out today (Remember kids, wear that Eye Protection! You don't want to go to school with an eyepatch and have to explain that it was a marshmallow injury, do you?). Pretty neat, huh? 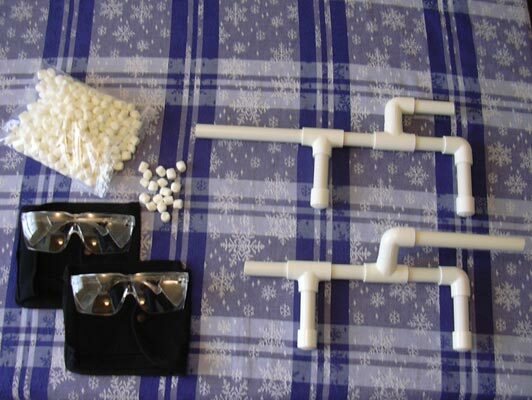 And if you're sad because you didn't get Marshmallow Blowguns, I'm sorry. Have a Merry Christmas anyway!